The Bank of England hiked interest rates in a widely expected move, raising the rates by 25 basis points. The BOE Governor advised that rate hikes will be gradual. Yesterday's rate hike was the first in a decade. The dovish forward guidance saw the British pound weakening strongly. GBPUSD fell 1.4% on the day while the EURGBP rose 1.8%. It was one of the strongest declines in the British pound in a year. In the US President Trump officially nominated Fed member, Jerome Powell to be the next central bank chair. Powell was one of the main contenders for the post. However, markets view Powell as a cautious dove, but he is expected to continue to push ahead with the current monetary policy course. Looking ahead the October payrolls report will be coming out today. According to the economists polled, the US economy is seen adding +300k jobs as normalcy returns. Revisions to September's payrolls data could also be weighing on investors as data showed a decline in jobs during the September month. The average hourly earnings are expected to rise 0.2% while the US unemployment is expected to remain steady at 4.2%. 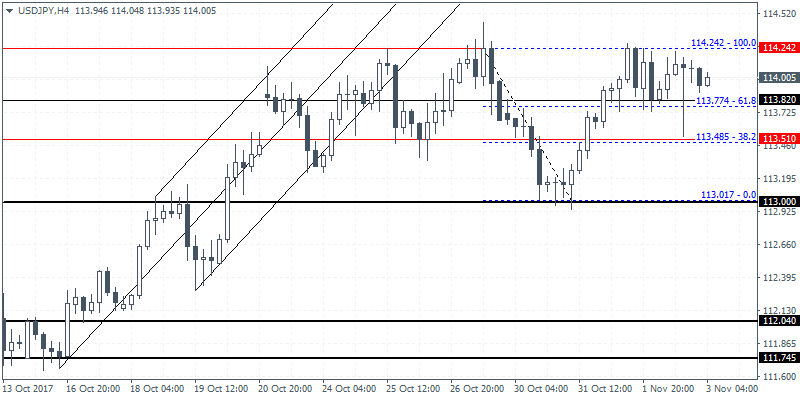 EURUSD (1.1657): The consolidation in the EURUSD continues as price action remains trading flat below 1.1672. The euro was seen posting modest gains, but did not manage to make any significant progress. 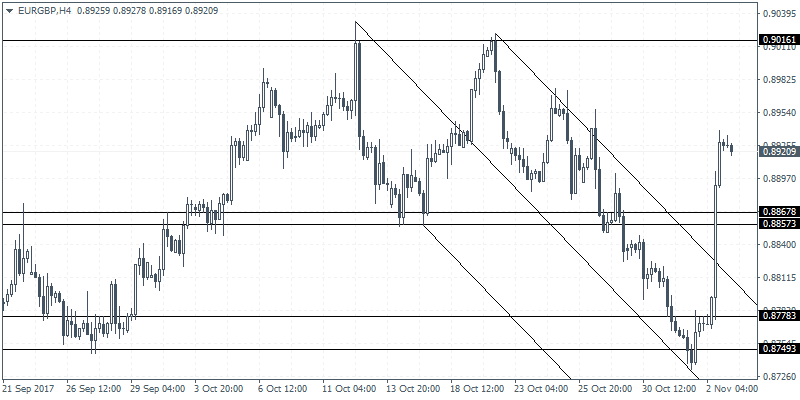 With price trading below the main resistance level of 1.1704 and 1.1672 we expect the bias to remain to the downside. On the 4-hour chart, the bearish flag pattern remains the main point of focus. Price action is expected to break down to the downside and will be validated on a close below the previous low of 1.1573. This will open the downside target in EURUSD towards 1.1411 eventually marking the completion of the bearish flag pattern. 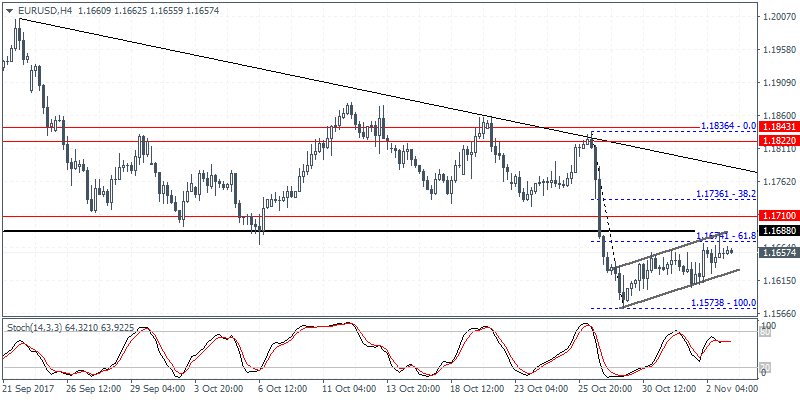 To the upside, a breakout above 1.1704 - 1.1672 could however signal a shift in the short-term direction. USDJPY (114.00): The USDJPY continues to trade near the major resistance level of 114.31 - 114.00 region. The sideways price action could signal a major breakout in the near term. On the 4-hour chart, we notice the inverse head and shoulders continuation pattern taking shape. Neckline resistance is formed at 114.24 which could be breached in the short term. This could put the upside bias in USDJPY towards 115.00 in the near term. However, failure to breakout above 114.24 resistance could mean that USDJPY will maintain the sideways range in the near term.